Most African Americans were freed 1965 with the passage of the 13th amendment that abolished slavery in the United States. This happened almost fifty-nine years before WWI. While African-Americans endured Jim Crow laws in the south and other forms of racism in the north, they were not truly free. In general, they faced oppression and suffered poor working conditions and low pay on the home front. During this time, there was also a great deal of tension between races, and this caused a lot of controversy on the home front. They both fought for America, and became united in that way. There was a racial division among the army (mostly due to segregation), and this was similar to the discrimination African-Americans experienced on the home front. I found an interesting article that dates right after the war. This article was written about a hearing in Hartford to gain more equal and civil rights for African Americans. The African American troops who arrived home from war were met were met with racial discrimination. The war marked a start of a long protest for more civil and liberal rights for African Americans. WWI played a big role in the start of the protests, in which, African American soldiers felt like they were truly equal to white people. They found out the hard way, but really pushed for equal rights. African-Americans were a big part in the success of the war on both the home front and abroad. Abroad they added a numerous amount of man power and will power to make the world democratic instead of communist. Although they played a big role in the war effort, African Americans still were facing racial injustice and inequality. While African Americans were facing racial inequality at this time, they shared their cultural heritage abroad, and many of the white American troops and French troops took a strong appreciations. During World War I many black troops were eager to fight but were delegated to provide support services. Only a small percentage were actually involved in combat. While they were only involved slightly, their culture and music helped the troops to pass time and enjoy themselves when war was not being fought. “The African American presence in France–helping in any capacity–often elicited overwhelming gratitude from the French. Photo of African American Soldiers playing instruments abroad, keeping the soldiers spirited high! Both the French and the American troops enjoyed listening to African American bands who sometimes introduced blues and jazz.” This was uplifting for the American army, and helped them the troops gain a stronger appreciation for African American culture, and their importance in the war. Interestingly, the troops were the only ones to start recognizing African Americans as equal, but on the home front it was a much different story. African Americans on the home front helped in the war effort by taking minimum wage jobs to help produce materials for the war. The African American people were scrutinized, and were used only for benefits. After the war ended, a lot of African Americans lost their jobs, and this can attribute to the Great Depression that would follow in the wake of World War I. This entry was posted in Capstone on March 1, 2018 by bensylvester8. Propaganda was widely used during World War I, and helped aid a United States victory in the war. Propaganda was important on the home front, and helping out the war effort. In order for people to see propaganda and get the most out of it, the creators of the propaganda posted the posters in strategic locations. These strategic locations are not only important, but they were fairly popular places, in which, a lot of people can view the posters. Also, the propaganda creators displayed the posters in certain areas to attract a certain crowd and to get a certain reaction from each gender. 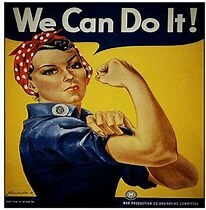 For instance, the army wanted to enlist women, so they posted empowering propaganda posters for women to join the work force on the Homefront in salons, grocery stores, and other places women commonly go to. Propaganda was a major key in the success of home front and victory in WorldWar I. Any sort of shop and area that was normally crowded was the ideal spot for a poster. The poster would touch thousands, if not millions of people, and it got a lot of different genders and ethnicities to join the war effort. I am planning to find a photo of shops and streets with propaganda posters, and I will do so by consulting an expert and using twitter as a network skill. This was propaganda used to target men during WWI. This entry was posted in #SA1833 Third HOT Log, Uncategorized on January 23, 2018 by bensylvester8. How my Life Changed After 6th Grade? It was 6th grade, and it was my second year in the Darien public school system. I was fairly new and so were my attitudes and actions. I loved basketball and I played travel A team for my old town. In 5th grade I moved to Darien, but did not make the travel team and it killed my inspiration and hopes for making the team in 6th grade. The day before try outs in 6th grade, my mother spoke and reached to me the most. She said, “Do your best and work hard, if you do not make it then you will make it next year because you will work harder for it and want it more.” This saying resonated with me and changed my attitude towards the try outs. After the try outs I felt pretty confident I would make the team, and in a few days everything was about to change. It was the day of the releasement of the teams for travel basketball. I was nervous, but also confident that I would make it. My parents and friends were almost positive I would make the team, and supported me throughout the process. When the decision came, I found out to my shock that I did not make the team. This devastated me and made me want to quit the game altogether. My parents saw how hurt I was, and knew exactly how to make me feel better. They whipped me up some chocolate chip pancakes, and then we had a deep and inspirational talk. My parents encouraged me to keep playing and to always keep my head up. They drived me to work harder and be more determined for any goal that I set forward. My parents also told me to keep a positive attitude and congratulate those of my friends who did make the team. I did just that and a week later I was rewarded. A kid from the travel team ended up quitting, and that’s when I got my chance to play and change everything. I was allowed on the team and ended up having a great year thanks to the advice of my parents. This kept me humble and a hard worker. I could never thank my parents enough and this has helped me in the project based learning class environment. The learning class environment is perfect for individual growth as well as class growth. I feel like my positive attitude and hardworking and determined mind set helps feed to a project based learning class, and not only helps me grow, but the class as well. I think this style of class is amazing, and something that needs to be more instituted nationwide. This entry was posted in Uncategorized on January 15, 2018 by bensylvester8. WWI Propaganda is best animated in posters used to influence civilians to help the war effort. The propaganda influenced all different races and both genders with the goal of funding the entire war effort. Propaganda also targeted certain states within the United States. One state that they targeted was Connecticut. Connecticut is a rather small state, but it held a strong value. Connecticut became one of the lead producers of weapons and materials for the military. Connecticut was a major asset in the victory of the allies during WWI, and it helped continue throughout WWII as well. Connecticut propaganda was specific and it targeted middle class people, woman, and the youth (specifically young adults from 18-22 years of age). The way Connecticut held its propaganda was very strategic and became beneficial throughout the war. Women becoming more empowered and important to war effort. I want to explore first how Connecticut targeted woman to join the WWI war efforts. The strategic minds of the military specifically got woman to work roles that were typical to a role of a man, in order to supply the troops and have the ability to send over more troops from the United States. The propaganda used to lure woman into the workforce was very well thought out and intricate. The propaganda writers wanted to appeal to woman and make them feel equal and important. This proved to be effective and became a major asset in funding the war efforts. This entry was posted in #SA1833 First HOT Log on January 4, 2018 by bensylvester8.